Tumbu flies, Cordylobia arthropophaga, lay their eggs on wet clothing, bedding, outdoor furniture, and in the soil or sand. Within two days, larvae hatch and can remain alive for up to two weeks. During that time, if they come into contact with skin, they penetrate. Once buried in the skin, one takes about a week to mature, and the point of penetration will gradually develop the appearance of a boil. On careful inspection a white larva can sometimes be seen with a pore-like opening. Sometimes movement can be felt. These skin lesions can become secondarily infected with bacteria. If left on their own, the larva eventually emerges. To remove the larva, coat the opening with petroleum or petroleum jelly, which will cause the larva to suffocate and come wiggling out of the opening backwards. You may need to extract the larva gently with tweezers, taking care to remove it completely and not only partially. Once the worm is removed, the wound should be washed well with soap and water, treated with antibiotic ointment, and covered with a light gauze dressing. The area should be observed for signs and symptoms of infection: redness, swelling, or area warm to the touch. 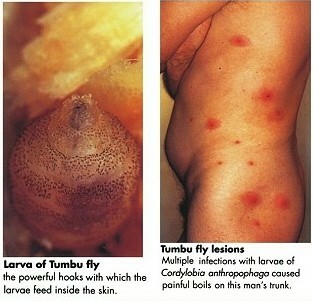 The best method of avoiding Tumbu flies is to place towels and laundry in the dryer or to iron before use. Beach towels are hard to protect, but endeavor to keep them off the ground and avoid sitting directly on grass or bare ground.